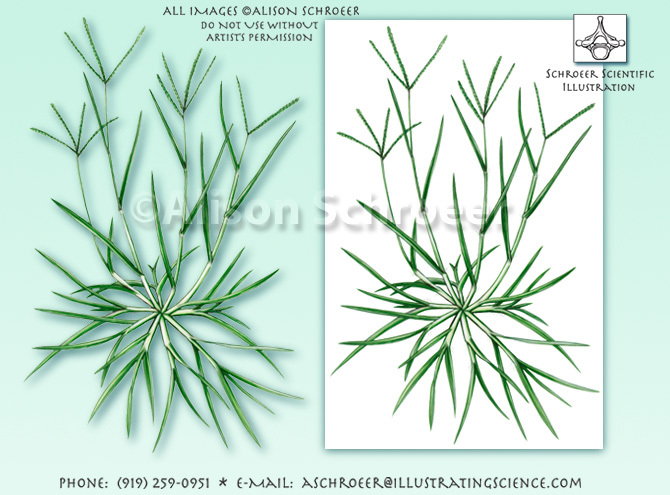 Goosegrass illustration, Eleusine indica. Grass plant illustration ©2008. This botanical art image was drawn by artist Alison Schroeer of Schroeer Scientific Illustration, to show a North American weed species. Botanical illustration artwork drawn with graphite and Prismacolor colored pencil on xerographic drafting film, and Adobe Photoshop. This biological drawing is in full color. Botanical, medical, and other natural science illustrations are available on commission. Please contact us to discuss a drawing or painting, and we can create biological art to your specifications.